Did you know that you can sell a property and defer the often substantial taxes due on sale simply by buying another property? The 1031 Exchange class explains what the program is, how to use it and when you can not use it. 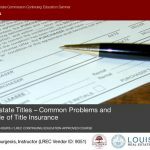 Deryle Bourgeois is a licensed Title insurance agent and notary public in the state of Louisiana and has closed more than 20,000 sales in and around the New Orleans area. A recognized expert in the field of 1031 exchanges, Mr. Bourgeois is regularly consulted by legal and lay persons alike for his knowledge and experience. 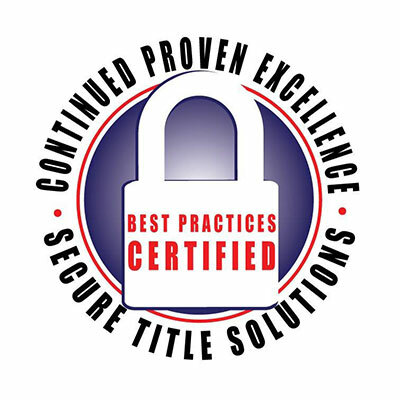 Since 1990, Mr. Bourgeois and Southern Title have structured dozens of 1031 exchanges, including complex build-to-suit and reverse exchanges. Module Eleven: Do Vacation and Second Homes Qualify for IRC §1031 Treatment? This course will provide the student with an understanding of 1031 tax deferred exchanges, their use, benefits to buyers and sellers, issues that can arise with their use and the mechanics of structuring such transactions. 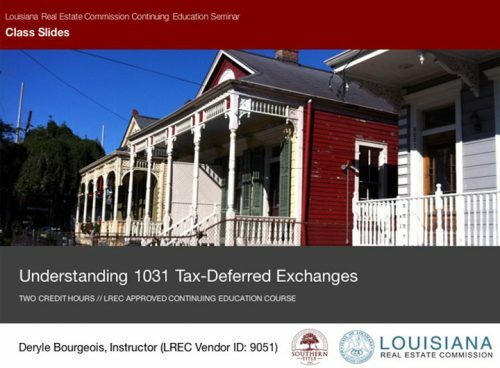 Examples will be used to explain the concepts covered in this course, and by the end of the seminar, the student will be familiar with 1031 exchanges, their usage and rationale.